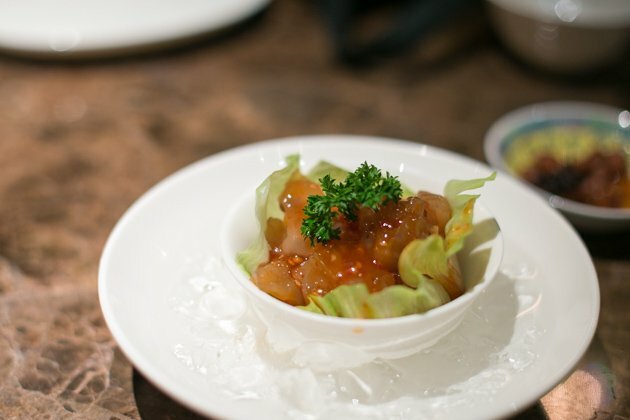 Translated to be ‘Third Wife’ in Cantonese, Sum Yi Tai was conceptualised to bring diners back to the unprincipled charms of Hong Kong back in the 1980s. 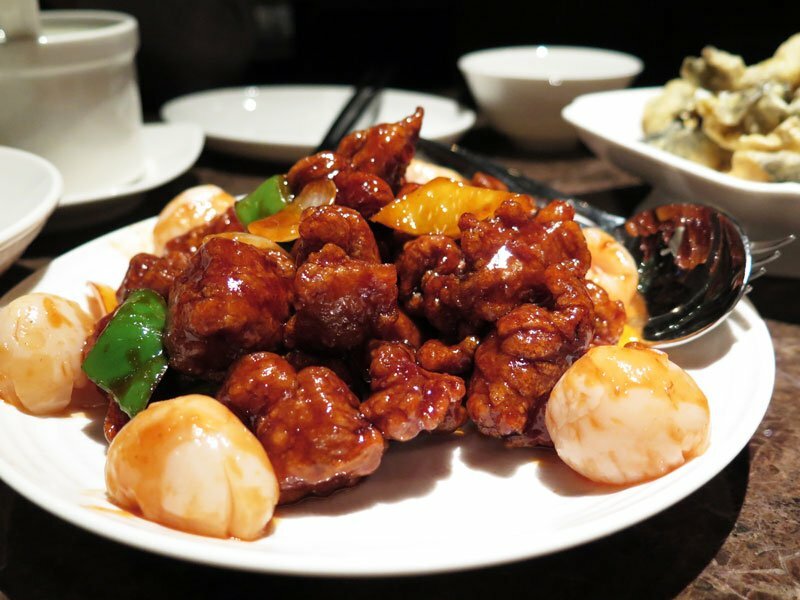 The whole meal experience is completed by the accompaniment of old-school Cantonese soundtracks which play soothingly in the background. With its hopes of spurring traditional Chinese cuisine into the domain of swanky, designer bars, Sum Yi Tai promises a spanking good time for its customers. Housed within a humble conservation shophouse along Boon Tat street, Sum Yi Tai offers 3 vastly different concepts over its 3 levels. 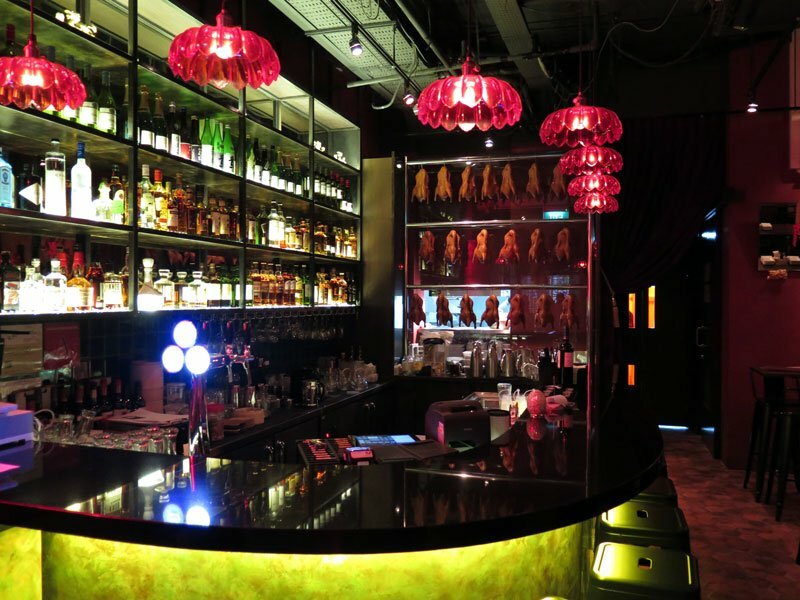 A more casual, laid-back atmosphere can be felt on the ground floor of Sum Yi Tai – tapas-style dishes are served up in the presence of a grandly lit gangland bar. 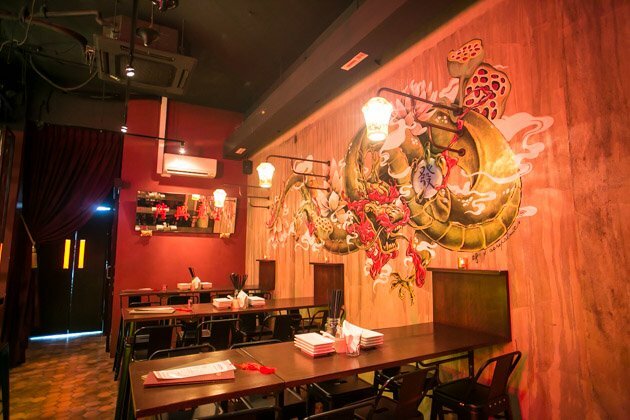 An impressive painting of dragons can also be found on the walls just right beside the eye-catching bar area. 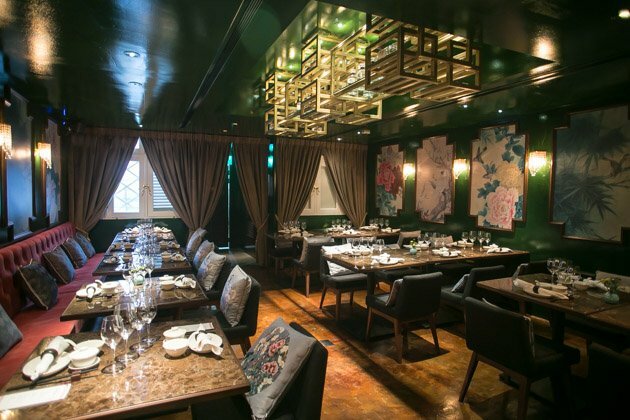 The second floor of Sum Yi Tai was where we dined at – it was way more grand and resplendent; draped in deep green and feminine colours. Traditionally portioned dishes, a good selection of wine and sake are all available here. Since all three concepts have been allocated with a level of their own, diners on the second level will not be able to order anything off the tapas menu, with the exceptions of some dishes served at both concepts. Overall, Sum Yi Tai’s second level is a cosy dining area which is definitely more suited for semi-formal lunches or dinners. To top it all of, the roof of the shophouse boasts a Private Rooftop where diners are free to soak in the majestic, lit-up and breath-taking CBD (Central Business District) view under the stars with the company of good whiskies, wines and cocktails. 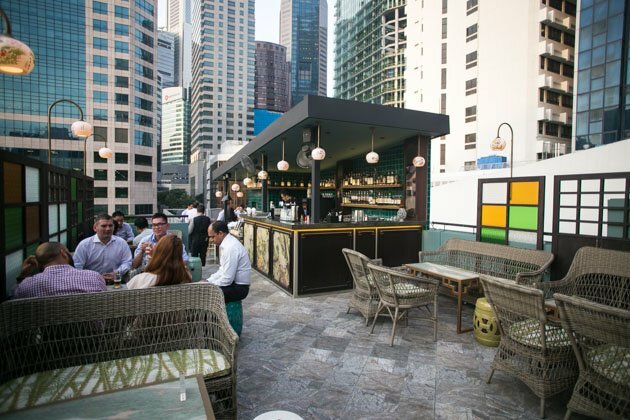 An intimate setting, the Private Rooftop is furnished with decorative screens and rattans – very reminiscent of Hong Kong. Do take note that there the Private Rooftop is available only by table reservations with minimum spend (due to the high demand). Chilled Jelly Fish With Citrus Spicy Dressing ($14). Refreshing, zesty and light, this was the perfect start to our meal. Infused entirely with its citrus spicy dressing, the jelly fish was tasty through and through: none of that tasteless, bland rubbery flesh which I had expected. Each bite will reward you with a satisfying chewiness to it – as a dish which you will keep going back for more, it was no surprise that this was scraped clean by the end of the meal. Crispy Fried Salmon Skin with Salted Egg Yoke & Lime Zest ($12). 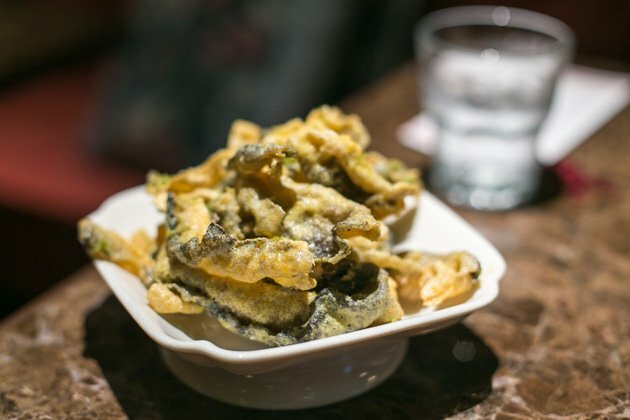 Wonderfully crisp by the crackling sound you would hear once you apply pressure on it with your teeth, these salted egg crusted deep-fried salmon skin are delectable. I was initially just a little put off by how oily they looked: every single piece of the fried salmon skins were glistening under the light. Then again, just share amongst friends so your guilt level doesn’t reach sky-high levels. 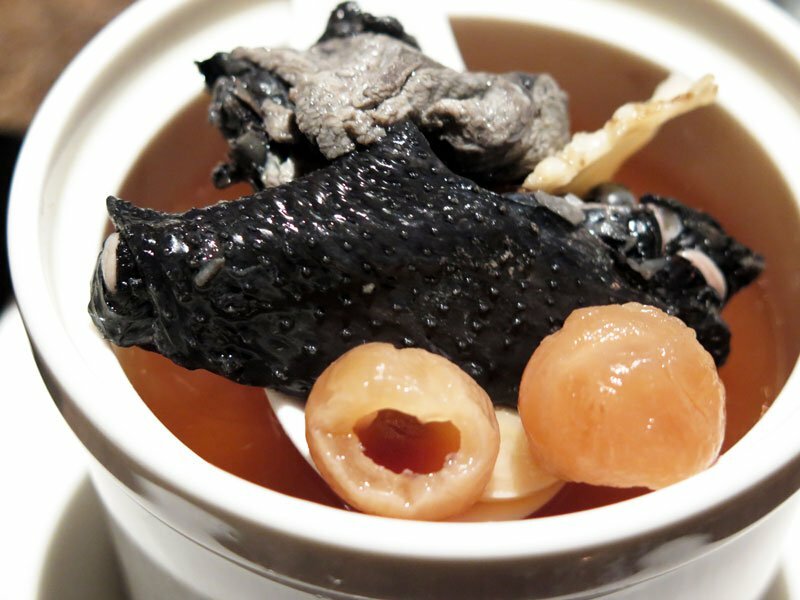 Double Boiled Black Chicken with Chinese Herbs ($15). This soup really reminded me of my mother’s cooking: it’s heartwarming, full-bodied and tastes like home. 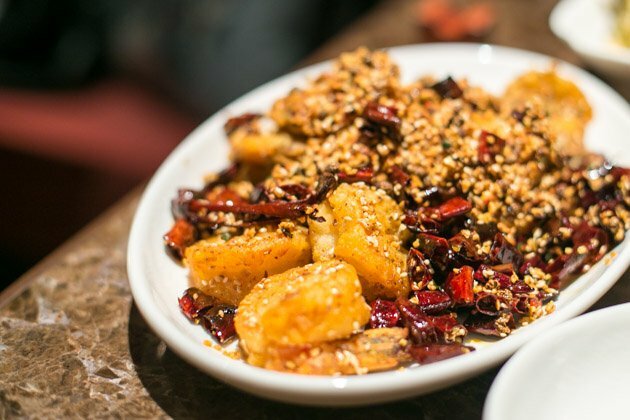 If you’re not a big fan of the herbal taste, then I would recommend that you steer well away from this dish because it tastes very strongly of traditional Chinese herbs like wolfberries and licorice root. If you’re a fan of the traditional Chinese medicine taste, this soup will definitely suit your tastes. Has some added dried longans to balance the bitterness with some sweetness. Wok-fried Sweet and Sour Pork with Lychee ($26). To be honest, this dish really reminded me of those which you can obtain from local tze char stalls. I was left wanting a little more from this dish after my first three bites – while the morsels of meat were tender and flavoured well, I didn’t think the quality of the dish justified its price tag. Wok-fried French Bean with Minced Pork in XO Sauce ($18). 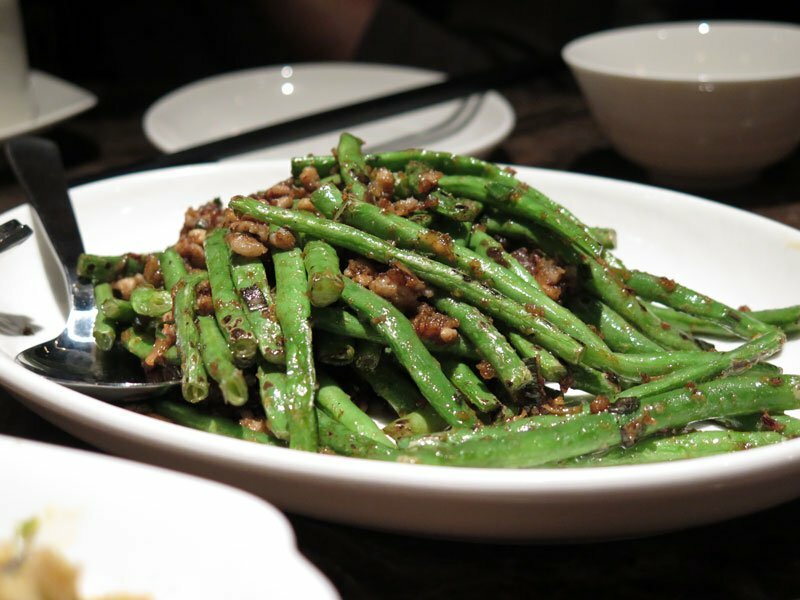 Crunchy with a bite, these French Beans were flavoured wonderfully with the XO Sauce. There was also a pleasant garlicky taste to the french beans. Once again, even though this was generally an enjoyable dish, I don’t see why it’s $18. Szechuan Style “La Zi Xia” King Prawns with Chilli and Peppercorns ($30). Fans of the Szechuan Mala Hotpot (四川麻辣火锅) will definitely enjoy this. Just one bite of firm, naturally sweet prawn will leave your mouth with a bit of numbness from the peppers. It might sound slightly sadistic to say it but the numbness was highly enjoyable and an interesting experience. For $30, you’ll be served up with 8 piping hot – literally – huge prawns, so I guess that’s rather worth it: seafood always chalks up the biggest bills. Siew Yoke Roast Pork ($12). I really enjoyed Sum Yi Tai’s Siew Yoke Roast Pork because of its crisp, golden-brown and deliciously thin skin. This is served as a tapas at the bar as well. The crunchiness gives way to lean meat interspersed with fats – meshing all together to create the magic which is Sum Yi Tai’s Siew Yoke Roast Pork. This was probably one of the more enjoyable and memorable dish of the night, and I’m surprised the french beans earlier would cost more. Chilled Lemongrass Jelly with Mixed Fruits ($6). 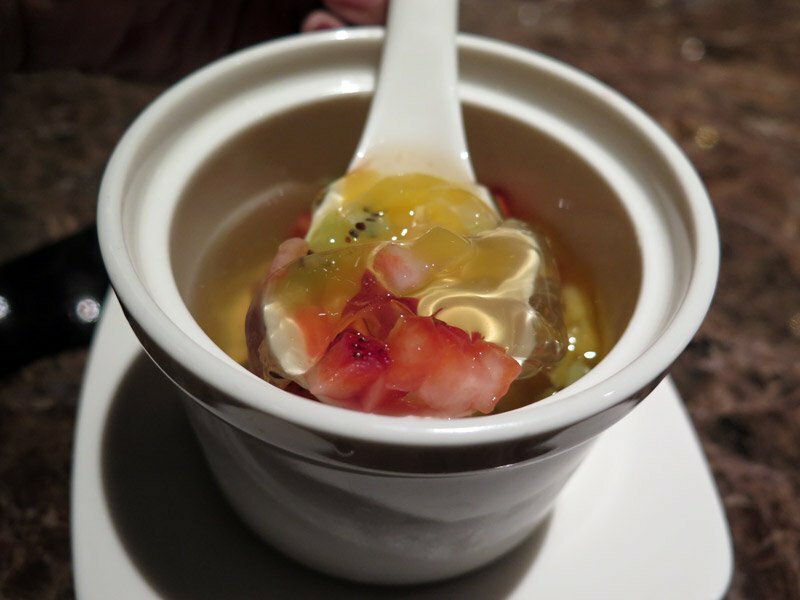 There is nothing much to say about this dish: it basically tastes just like what its title suggests: chilled lemongrass jelly paired with cute, tiny squares of mixed fruits – strawberries, kiwi and mango. For those who would love a less heavy dessert, you should definitely give this a go. 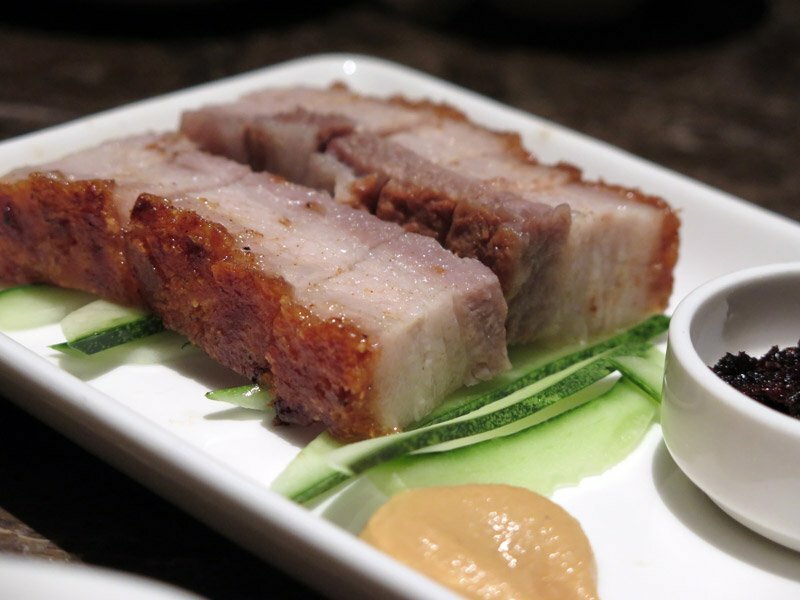 Overall, I would say that the whole dining experience at Sum Yi Tai was highly enjoyable – the restaurant has really managed to channel the vibes of a decadent and immoral Hong Kong in the 1980s, without injecting any elements of sleaziness. Even the staff look like gangstas. The food here is decent but there’s nothing absolutely mind-blowing with such fare available everywhere in Singapore: what you actually pay for would be the entire theme and ambience of Sum Yi Tai. Maybe I’ll return to get a feel of what their ground level is like. 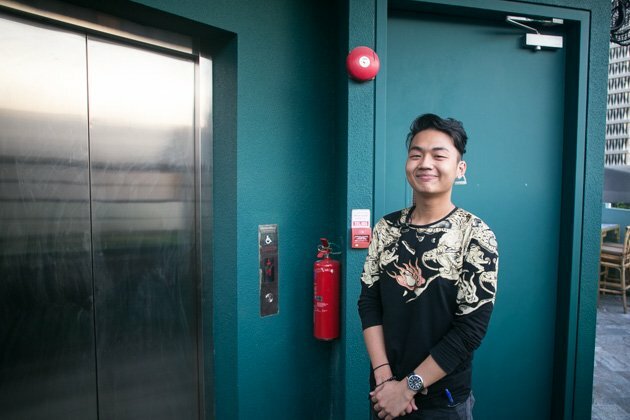 NUS Psychology undergraduate who does not read the minds of others. She's a thrill-seeker who craves for that adrenaline rush right after a rollercoaster ride. Or, if that's not available, she'll easily settle for a delicious burger packed full of gravy.